We're crazy about kale. With only 30 calories per serving, heaps of vitamins A, C, and K, minerals, and other great nutrients, this green is a force to be reckoned with. Don't get scared away by its bitter flavor, because this recipe perfectly balances it out with delicious acorn squash, vegetable broth, and nutmeg. 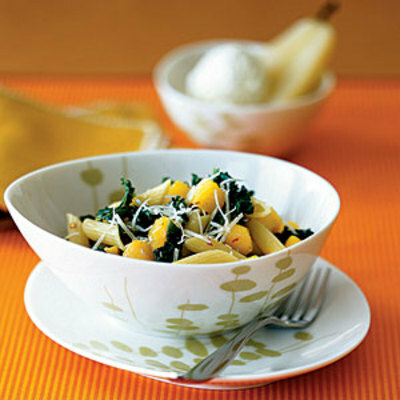 Mixing the ingredients with penne completes the healthy meal, with only 306 calories and 6 grams of fat. To make it even more guilt-free, use whole wheat or whole grain pasta. To make this dish, place squash in a casserole dish with 1/4 cup water. Cover with plastic wrap. Microwave 7 minutes on high or until tender. Heat oil in a Dutch oven over medium-high heat. Add garlic; cook 1 minute, stirring constantly. Add kale and broth; cover. Cook 3 minutes, stirring occasionally. Uncover; cook 1 minute. Stir in the salt, pepper, and nutmeg. Stir in squash and pasta, tossing gently. Sprinkle with cheese.